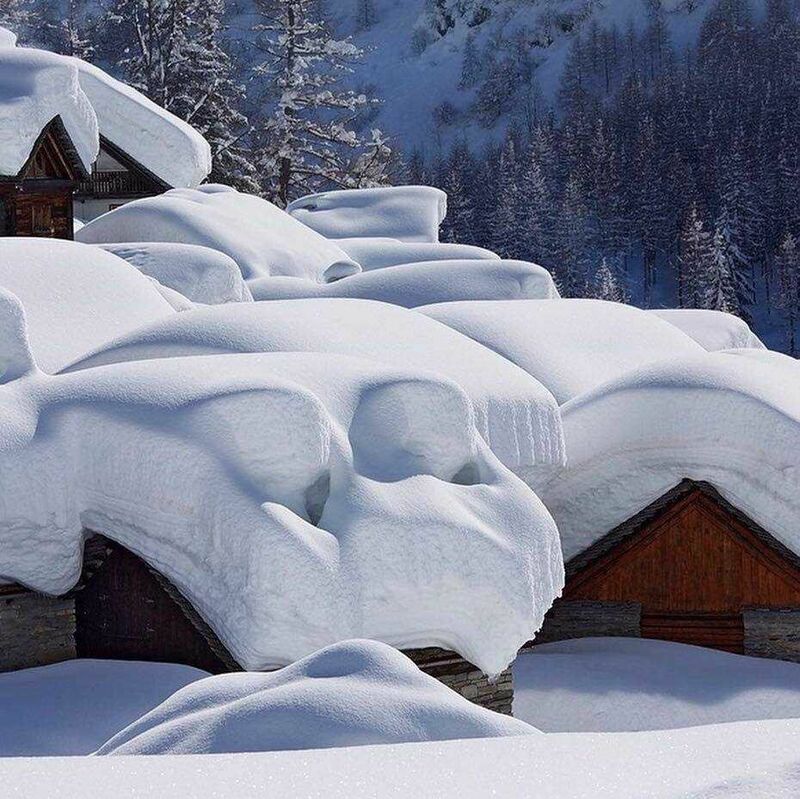 There is an huge amount of snow in the north and northwest of the Alps. Since the end of 2018 it has been snowing continuously in large parts of Austria. Austria has received 6 times more snow than average for the first half of January. Substantial amounts of fresh snow also came down in Switzerland last weekend. 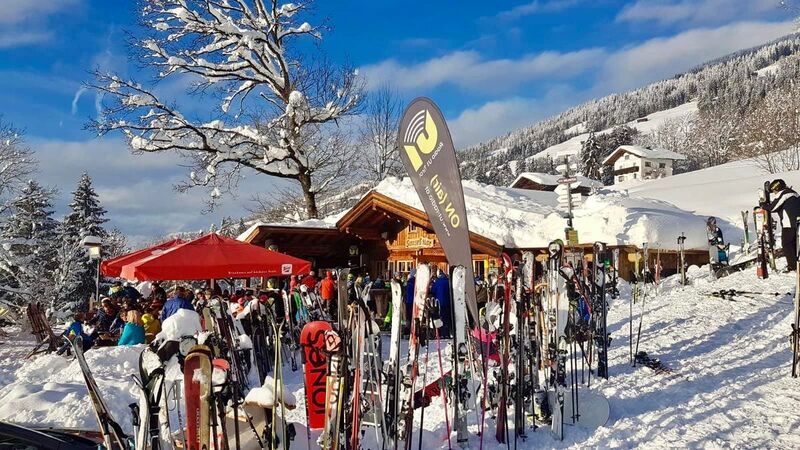 In addition, the northern French Alps have benefited from more fresh snow recently than was initially forecasted, with ski resorts such as Val d’Isère, Chamonix and Flaine welcoming around 30 to 60cm. Broadly speaking, an average of 35 to 100cm of fresh snow came down in the northern Alps with local peaks towards 150 cm between Saturday evening and Monday evening. It snowed heavily especially in the east of Switzerland, Vorarlberg and the west of Tyrol, but in the French northern Alps a lot of snow came down as well. Some useful snow did get through here and there in the southern Alps, notably close to the Swiss border. Conditions have improved substantially in the ski resorts Cervinia and Livigno. Even the Dolomites had 10cm of much needed snow at the start of the week. On the whole, most southern Alpine resorts again missed the heaviest of the precipitation. There are exceptional snow depths right now in the central and eastern Swiss Alps in resorts such as Engelberg and Andermatt, and across most of the northern Austrian Alps, in resorts such as St Anton, Obergurgl, Loser / Altaussee and Obertauern snow depth exceeded the 300cm mark. The world's deepest snow depth reported by a ski area has reached 6 metres on higher slopes at the Swiss resort of Andermatt Sedrun-Disentis. Remember these are settled snow depths as reported by piste patrol. In terms of cumulative snowfall, some of these regions have seen 3-4m of new snow since the turn of the year. The next few days will be much quieter across the Alps than we have seen in recent weeks. A high-pressure area exercises enough influence over the Alps from the west. 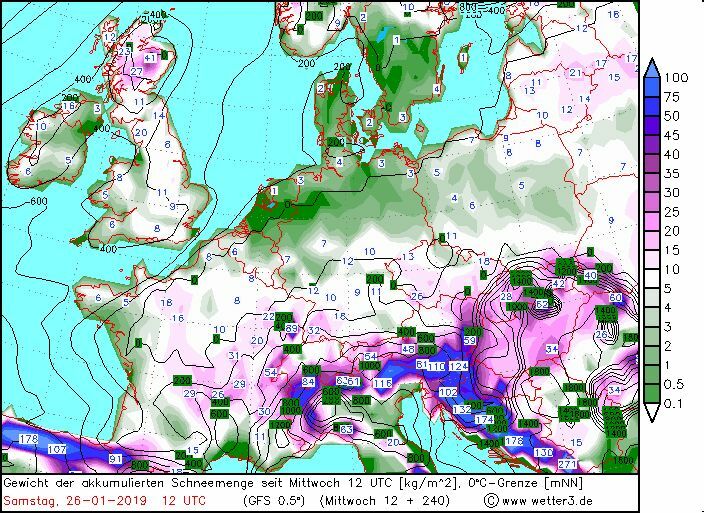 That doesn’t mean the weather will be completely fine, in fact there is likely to be some quite widespread but light snowfall across the Alps on Thursday. However, we will not see anything like the intensity of the storms that have battered the northern Alps in recent days, at least for the time being. On Thursday, a cold front will enter the Alps from the northwest with light snow fall expanding towards the east as the day progresses. It will persist until Friday morning, when the weather will become mostly sunny from the west. The snowfall level will be approximately 800 m.
On average, there is about 5-20 cm where the snow line will completely go down again. Up to 30cm in the North. This time, a large part of the eastern Italian Alps also seems to get snow. Friday and the days after, it remains cold and lightly changeable. There is often room for the sun. Sunday appears to increase the chances of large-scale snowfall from the southwest where the Italian Alps would also get a lot of powder. Tomorrow, see if that trend is still there! To a growing extent, fresh snow drift accumulations and higher temperatures in the middle of the week will keep the avalanche danger on the high to very high level. Something interesting showing up on GFS for next week. A Mediterranean low bringing heavy snow (and fairly low temperatures) to the southern French / southern Italian Alps on Sunday, extending to the entire Italian and southern Swiss Alps early next week. Drier for Austrian, northern French and northern Swiss Alps, but still potential for some snow spilling north across the Alpine ridge.